Most of the United States’ special envoys will be abolished and their responsibilities reassigned as part of the State Department overhaul, Secretary of State Rex Tillerson told Congress on Monday, including envoys for climate change and the Iran deal. Special envoys for Afghanistan-Pakistan, disability rights and closing the Guantanamo Bay detention center will be eliminated under the plan. But President Donald Trump’s administration plans to keep envoys for religious freedom, fighting anti-Semitism and LGBT rights, despite speculation from critics that it would seek to downgrade those priorities. Lawmakers of both parties, think tanks and even the diplomats’ association have long called for absorbing some of the countless U.S. envoys and special representatives into related offices, to help reduce redundancies across the State Department’s notoriously unwieldy bureaucracy. But the idea has attracted new scrutiny amid the Trump administration’s plans to drastically cut the State Department’s budget and concerns that Trump was eschewing the promotion of American values overseas. While State Department officials stressed that changes to the flow chart don’t necessarily signal a change in priorities, in some cases the policy implications are clear. Elimination of the Guantanamo closure envoy dovetails with Trump’s plans to keep the prison open. The president has pulled the U.S. out of the Paris global climate deal and threatened to do the same with the Iran nuclear deal. Of 66 current envoys or representatives, 30 will remain, a cut of 55 percent. Nine positions will be abolished outright. Twenty-one will be “integrated” into other offices, five merged with other positions, and one transferred to the U.S. Agency for International Development, the government’s foreign aid arm. In each case, the envoys’ staff and their budgets will be absorbed by the office taking over their functions. That shift will free up significant funds that Tillerson can draw upon as he restructures other parts of the agency, said a State Department official, who wasn’t authorized to comment by name and requested anonymity. For example, merging the cyber envoy into the broader Economic and Business Affairs bureau will boost the latter’s budget by $5.5 million. Tillerson, in a letter to Congress, said he believed the State Department could “better execute its mission” by integrating some positions, pointing out concerns that the current system diluting the government’s effectiveness by creating multiple power centers dealing with the same issue. The number of special envoys has grown over the years. 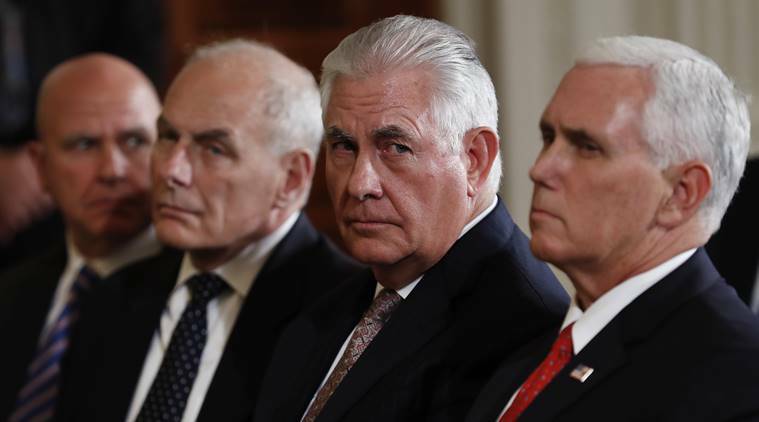 “Today, nearly 70 such positions exist within the State Department, even after many of the underlying policy challenges these positions were created to address have been resolved,” Tillerson wrote. The pruning offers the first concrete information about how Tillerson’s sweeping overhaul will affect the State Department and its approximately 75,000 employees. Since taking office in February, Tillerson has been scouring the agency and soliciting input from diplomats about how to trim the agency down. A roughly one-third budget cut and elimination of thousands of jobs are expected. Those anticipated cuts have driven down morale among diplomats, as Tillerson has acknowledged, playing into concerns that Trump’s “America First” approach means the U.S. will stop promoting human rights or helping the most vulnerable global populations. The Trump administration will keep envoys or at-large ambassadors for women’s issues, hostages, Israeli-Palestinian negotiations, human trafficking, HIV/AIDS and Holocaust issues. There will no longer be special envoys for the Arctic, Syria, Myanmar, Libya, Haiti, Sudan and South Sudan, though regional offices will assume those portfolios. The envoy for six-party talks in North Korea, currently vacant, won’t be filled. In a 2014 report, the American Foreign Service Association, which represents career diplomats, recommended retaining only a handful of envoys while eliminating or merging the rest. Some special envoys are mandated by Congress. The Trump administration will ask lawmakers to repeal those mandates.